but that these will be on the surface, and you will feel your true being within, separate from them, observing but not carried away." Enhance your ability to listen deeply and with reverence to all the body does for you. In this manner we develop an acute sense of oneness. Attunement to our inner reality fosters physical health as well as a quiet mind. 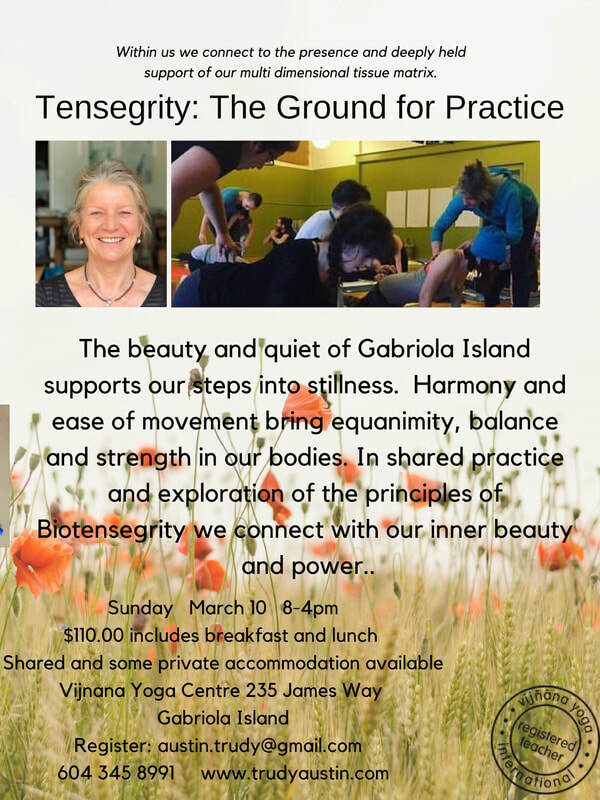 Biotensegrity is connection and wholeness. ​Consciousness suffuses practice and expresses itself through connection within. Connecting and observing, our attention is rooted in the present moment and communication opens and reveals the deepest, subtlest sense of who we are. Flowing, sensing and breathing set the right energetic tone and expression of the magic stillness that holds all vibration and oscillation. vayu practice informs movement, asana, pranayama, as well as supports health and well being. My body of work encompasses a wide range of movement and meditative practices that everybody, and every "body" can achieve. Finding TRUE range of motion in a given moment, during a specific movement, and then to find clarity about the sensations in the body — this is how we practice. We look to keep the joints floating like a neutral zone, as in a canister, a balloon. Strengthening the muscles and bones is an important part of what makes us strong and resilient to the rigors of life. Your body matrix is so much more however, and we begin to build from the smallest pieces to the largest to learn to honour and to get to know our bodies. In this way we become strong and fully capable of making appropriate connections with the signals the body offers us as we live our daily lives. ​and sustain your healthy and productive lifestyle.